The Canadian Federation of University Women Fredericton (CFUW) recently established a new award at the University of New Brunswick. The Dr. Nora Ni Chuiv CFUW Fredericton Graduate Scholarship is an endowed scholarship that will provide $2,000 annually for women pursuing graduate studies in UNB’s Interdisciplinary Studies program. This will bring the CFUW Fredericton’s scholarship endowments at the University to a total of more than $580,000. “This is a remarkable degree of support for our university, for which we are truly grateful,” said Eddy Campbell, UNB president. 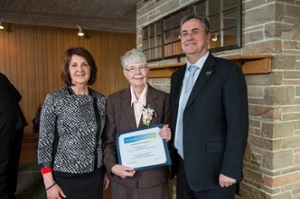 The new scholarship, the seventh established by CFUW Fredericton, also honours the long career and dedication of retired UNB mathematics professor Nora Ni Chuiv, a longstanding member of CFUW Fredericton. CFUW Fredericton funds its scholarships largely through the proceeds of its annual book fair, which celebrates its 50th anniversary this year and will be held at the Brookside Mall in Fredericton on May 29-31. CFUW Fredericton financially supports rural school libraries, music programs, post-secondary education for women, and international education for girls and women. It also promotes awareness of such issues as homelessness, human trafficking and pay equity for women and advocates for the rights of women and girls. For further information, visit their website at www.cfuwfredericton.com.